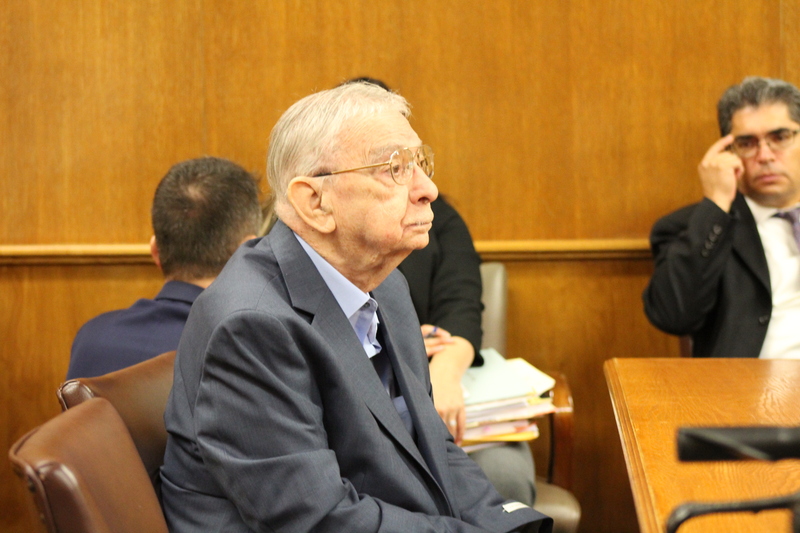 EDINBURG, Texas (CN) – John Feit, the 85-year-old ex-priest convicted in December of murdering his parishioner Irene Garza half a century ago, will appeal the verdict, his attorneys said Tuesday. A Hidalgo County jury sentenced Feit to life in prison on Dec. 8, rejecting his claim that he had nothing to do with the Easter weekend 1960 suffocation death of the popular schoolteacher, a former Miss South Texas. Testimony at Feit’s seven-day trial in Edinburg centered around a 57-year-old Catholic Church-led conspiracy blamed for covering up Garza’s murder: one of the nation’s oldest cases brought to trial. Feit, long suspected in Garza’s slaying, removed his hearing aid and did not face jurors as Hidalgo County Judge Luis Singleterry delivered his sentence. He remained emotionless throughout trial, taking notes, chewing gum and sipping from a Styrofoam cup at times. He declined to testify in his own defense. O. Rene Flores, Feit’s lead defense attorney, filed the notice of appeal Tuesday afternoon. It does not specify what issues will be brought up on appeal and Flores did not respond to a request for comment late Wednesday. Prosecutors called Feit a “murderous animal” with a depraved heart. On Holy Saturday 1960 he pulled the 25-year-old elementary schoolteacher by the arm out of a confessional at Sacred Heart Church, attacked her inside the church’s rectory next door and gagged her with a cellophane bag in a bathtub, trial testimony revealed. Feit, then a 27-year-old visiting priest, fondled Garza’s breasts before she spoke her last words: “I cannot breathe, I cannot breathe,” a former monk, Dale Tacheny, testified. Tacheny said Feit confessed to the murder three years after he did it while the two were at a Trappist monastery in Ava, Missouri. “Instead of praying for her soul, he preyed for a victim,” Assistant District Attorney Michael Garza told jurors before they deliberated the sentence. Jurors heard from 22 prosecution witnesses, saw graphic autopsy photos and reviewed evidence almost 60 years old. Evidence included a faded green Kodak slide viewer with a long cord found at the crime scene that Garza said could have been used to tie her up. Prosecutors built the state’s case at trial through stories of three other South Texas women whom Feit either attacked in church, or had disturbing interactions with. They said Feit had a penchant for attacking young women in high heels from behind while they prayed in church. Feit pleaded no-contest to a reduced charge of aggravated assault for attacking 20-year-old college student Maria America Guerra just three weeks before Garza was murdered. Guerra fended off Feit by biting his finger as he placed a rag over her mouth inside a church sanctuary, enough that she drew his blood, prosecutors said. Feit was fined $500 in that case but given no jail time. That 1962 plea was entered in the same courtroom where he stood trial in December, more than 55 years later, in almost the same seat. Prosecutors said at trial that a Catholic Church cover-up protected Feit from prosecution for Irene Garza’s murder for nearly six decades, to protect it as an institution and minimize scandal. The claim was bolstered by an internal church letter read for jurors that implicated local authorities in a plan to detract attention away from Feit. The letter revealed church fears that Feit’s involvement in the beauty queen’s murder could harm the campaigns of county officials, and of Massachusetts Senator John F. Kennedy, a Catholic running for president. Five days into trial, Judge Singleterry rejected a defense request for a mistrial, finding that an expert witness’s brief mention of Feit’s 1960 polygraph during his testimony was not enough to bring the trial to an early close. The witness, Richard Sipe, had been barred from bringing up anything not already entered into evidence. Other issues raised by defense attorneys included the unsealing of what was left of the items Garza wore on the night she went missing. The decades-old evidence remained displayed on a courtroom table throughout trial. Singleterry also allowed the testimony of Ana Maria Cavazos Hollingsworth, despite objections over hearsay admissibility. Hollingsworth, 83, testified about a conversation she had with Irene Garza on the week of her murder. They were sitting on a twin bed when Irene confided that she had become “disturbed” by a new priest “who thinks he’s handsome” and wouldn’t let her complete confession. “She didn’t know what to expect anymore,” Hollingsworth said, adding that Garza appeared to struggle with whether she should give confession on Holy Saturday. At a news conference after trial, prosecutor Garza expressed confidence in the state’s case when asked about a possible defense appeal. “I think we’re solid,” the prosecutor said. Feit, who turned 85 a week before trial, suffers from various illnesses, including stage 3 kidney disease, bladder cancer, spinal stenosis and diabetes, his attorneys have said in court documents. He left the priesthood in the early 1970s after stints in monasteries in Iowa and Missouri, married and had three children and grandchildren. Formerly of Scottsdale, Arizona, Feit was transferred on Dec. 18 to the Texas Department of Criminal Justice’s Byrd Unit in Huntsville to serve his life sentence.